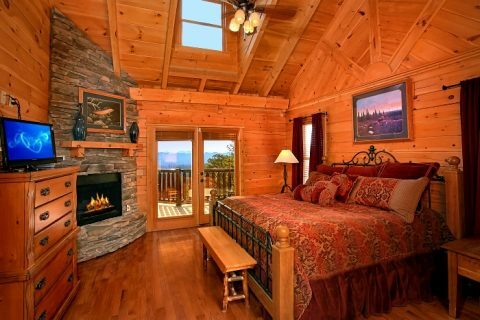 Welcome to "Above The Smokies," a secluded luxury cabin that's only minutes away from Dollywood Theme Park! 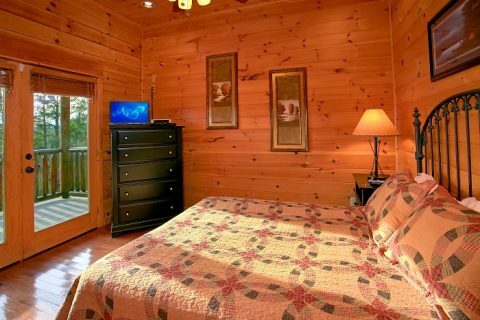 After an action-packed day riding coasters like Wild Eagle and the Firechaser Express, you'll love returning to this spacious cabin with everything you need to relax. 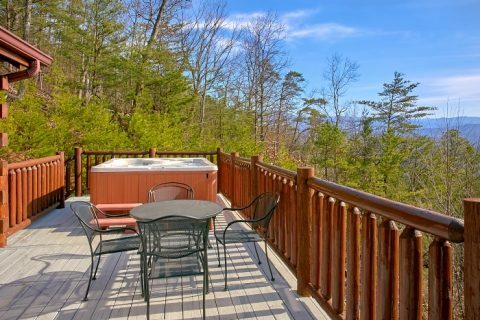 Best of all, this Pigeon Forge rental boasts an amazing mountain view that allows you to see for miles and miles. 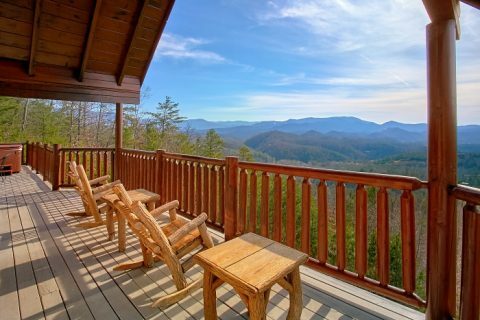 With gorgeous scenery just outside your cabin's door, you can experience what it's like to stay perched above the Smoky Mountains. 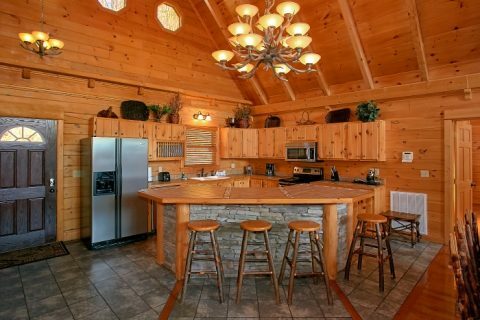 With 5 bedrooms and room for up to 14 guests, this premium Pigeon Forge cabin is ideal for a big family vacation or a gathering of good friends. 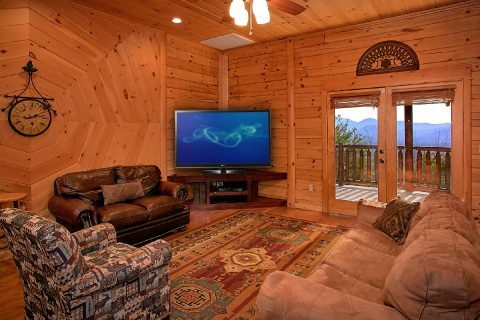 By entering into the spacious living area, you'll find a welcoming space complete with high ceilings and picture windows that showcase this cabin's impressive view. 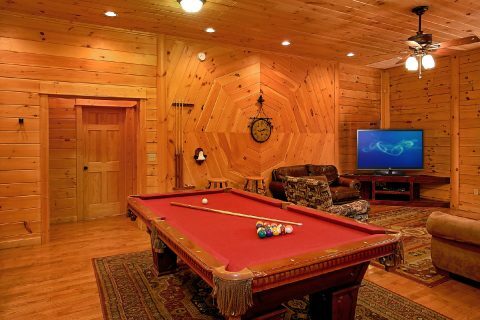 This room also comes complete with 2 sofas, a 42" HD Plasma TV, and a large stacked-stone gas fireplace. One of the sofas is a sleeper sofa that's perfect for accommodating extra guests. Nearby, your cabin's first kitchen area features stainless-steel appliances and a custom stone kitchen island with seating for six guests. 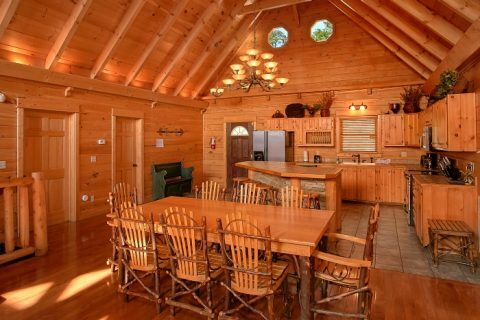 A large handcrafted dining table comfortably seats 8 more guests with a beautiful Smoky Mountain view as your backdrop. 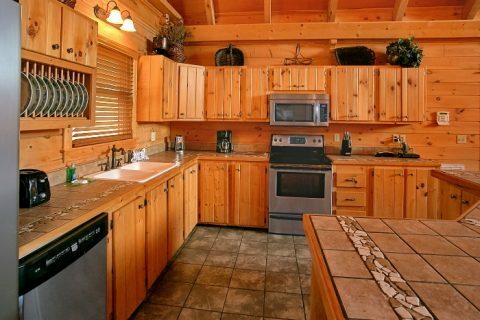 Additionally, your cabin offers a charcoal grill for cooking up delicious dinners in the great outdoors. 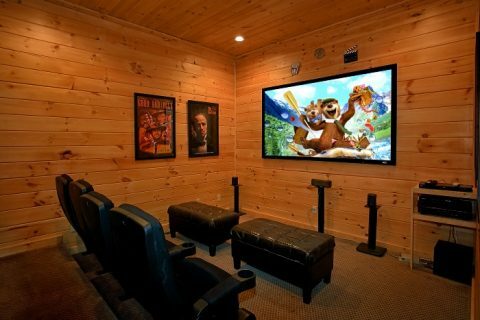 Downstairs, you'll find great entertainment in this cabin's game room and theater room! The game area features a pool table and a 30-game arcade game that can be enjoyed by 1 or 2 players. 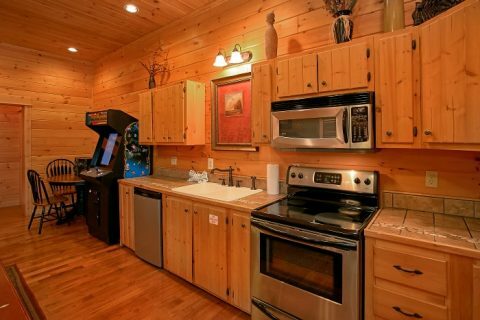 Better yet, this game area features another full kitchen with appliances for enjoying a tasty snack or refreshing beverage in the game room. A nearby sitting area boasts a 52 inch HD flat screen television and DVD player. 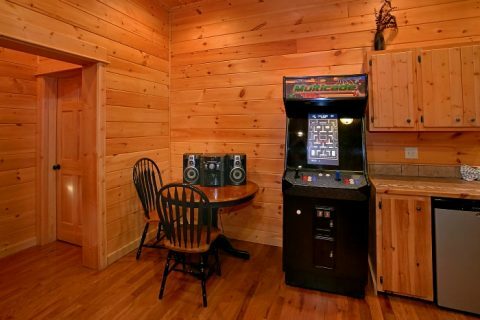 You'll find your cabin's 2nd sleeper sofa in this room. 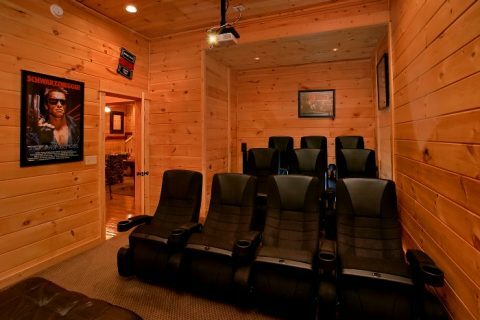 Nearby, you can enjoy an excellent home entertainment experience in the theater room complete with 10 theater-style seats, a projection screen, with television, Blu-Ray, cable, and quality surround-sound. 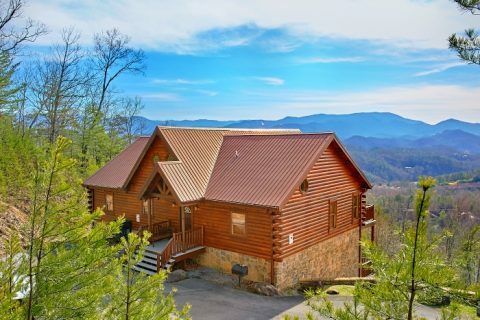 For enjoying this private cabin's gorgeous location, "Above The Smokies" boasts two decks complete with patio furniture. 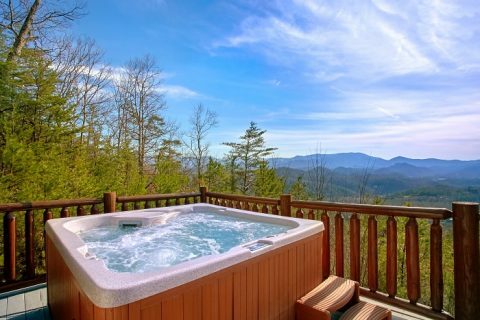 The upper-level deck even features a 7-person hot tub for enjoying a relaxing soak in the fresh mountain air. Thanks to this cabin's prime location that's only minutes away from Pigeon Forge, you'll have no trouble seeing top local attractions like Dollywood, The Titanic Museum, or the historic Old Mill. 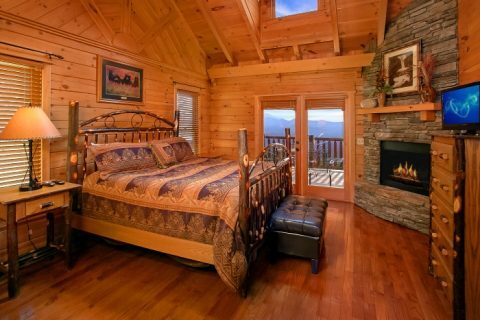 After a great day of experiencing the best the Smoky Mountains can offer, you'll love unwinding in one of your cabin's 5 private bedrooms. 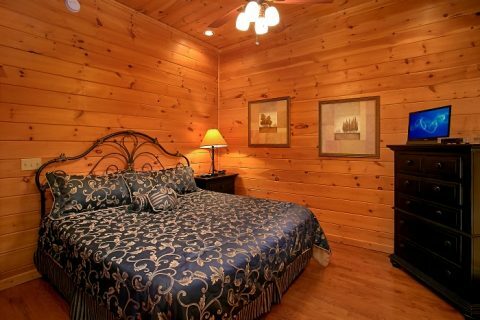 Each bedroom comes complete with a king-size bed, a television, and DVD player. The two master bedrooms on the main level offer great views and access to the upper deck. 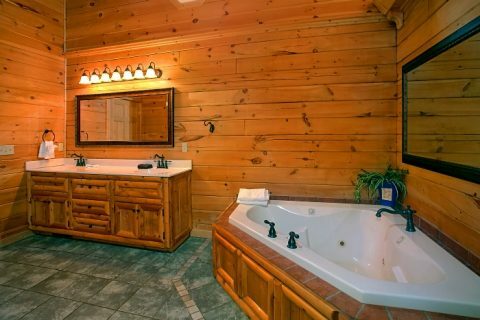 Each of these rooms boasts access to a full bathroom with a double vanity, a 5-ft walk-in shower, and a 2-person jetted tub. On the lower level, you'll find 3 more king-size bedrooms. 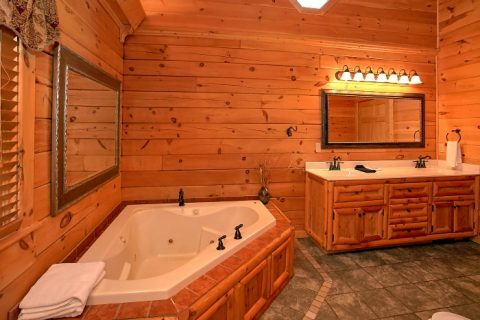 There are 2 full bathrooms on this floor and one of these bedrooms provides a private bath with a stand-up shower. Altogether, this luxurious cabin sleeps 14 guests in comfort. 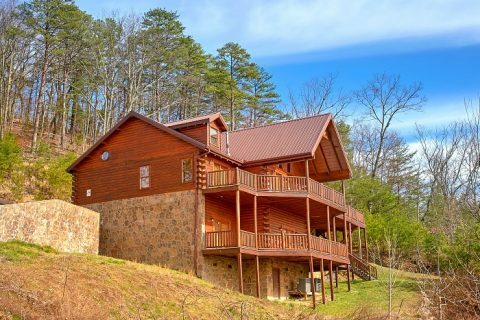 This secluded cabin in the mountains also features WiFi Internet and a washer & dryer for your convenience. 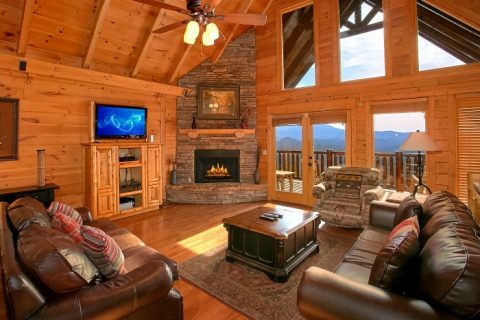 Reserve "Above The Smokies" for a Pigeon Forge cabin vacation you won't soon forget! 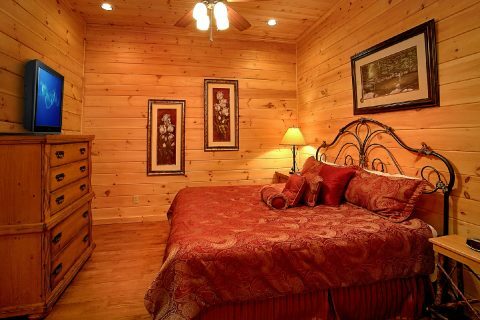 Best of all, you can book your luxury rental today to save 15% on your nightly rate with Cabins USA's discount!